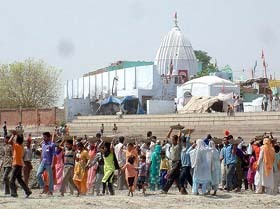 Mahant Baldev Giri, Mahant Ram Lubaya, Mahant Bhan Dass and Mahant Raj Kumar today decided to file a contempt of court application against the large scale kar seva at the ancient temple here even as hundreds of kar sevaks gathered on the call of various Valmiki organisations for seva amidst tight security here. Kar seva in progress at Ram Tirath temple on the call of Valmiki organisations on Sunday. Resentment prevails among a large section of Sikhs and members of other communities after the Assistant Returning Officer of Talwandi Sabo issued a notice to the manager of Takht Damdama Sahib, directing him not to allow the SAD to hold its political conference at Bhai Dal Singh Diwan Hall, situated on the Takht complex, on Baisakhi as it would violate the model code of conduct. Excommunicated Sikh scholars Gurbaksh Singh Kala Afghana and Joginder Singh, Chief Editor of Spokesman today took on the Shiromani Gurdwara Parbandhak Committee for honouring late Gurcharan Singh Tohra with the Panth Ratan Award. The Congress and the Shiromani Akali Dal today came on one platform to pay homage to Akali patriarch Gurcharan Singh Tohra at the “bhog” ceremony of the late leader here. The Congress continued with its theme of projecting the “honesty” of Tohra and stressing that the “panth” did not belong to one particular group. Mr Harkishen Singh Surjeet, General Secretary, CPM, while addressing an election rally in favour of the CPM-Congress nominee for the Hoshiarpur Lok Sabha seat, Mr Darshan Singh Matoo, at Pojewal, about 25 km from here, today called upon people to vote the NDA out of power in the ensuring parliamentary elections. The Sangrur Lok Sabha seat, a citadel of the Akalis, will witness a triangular contest this time. SAD nominee and Union Minister Sukhdev Singh Dhindsa, SAD (Amritsar) supremo Simranjit Singh Mann, MP in the dissolved House, and Congress nominee Arvind Khanna, MLA and known philanthropist running a voluntary organisation Umeed Khanna Foundation, are the main contestants. Two persons — Satnam Singh (23) and Jagtar Singh (28) — residents of Sandalpur and Harpura villages, respectively, were nabbed after an encounter with the police at T-point Sialka village in Majitha police district last night. 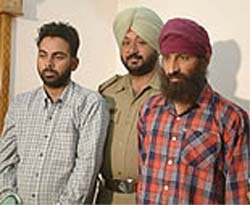 Satnam Singh Satta (left) and Jagtar Singh Kala, who were nabbed by the Majitha police after an encounter near Sialka village in the Majitha police district. In another breakthrough in the Goraya rail blast case, the district police has seized a huge cache of arms and explosives and arrested a woman belonging to the Lashker-e-Toiba during a joint operation with the Army in Jammu and Kashmir. A terrorist was killed in an encounter during the search operations. In a joint declaration on the conclusion of two-day Indo-Pak Heart Summit, the delegates today asserted to achieve “Healthcare for all by year 2010” unitedly. The joint declaration was announced by the Patron Escorts Hospital Dr Naresh Trehan and Prof Javed Sajid Khan, head of Punjab Institute of Cardiology, Lahore, here today. A Jalandhar Doordarshan’s health programme has made a Pakistani couple visit Jalandhar for the treatment of infertility that has been plaguing the life of 51-year-old hotelier Mohammed Ahmed Sandhu and his second wife Asia Bibi. Controversial Nihang chief, Baba Ajit Singh Poohla, today admitted that he had changed his name from Jaswinder Singh to Ajit Singh after his baptism in 1975 and not after 1980s after being declared a Proclaimed Offender as was alleged by Col G.S. Sandhu, Chairperson, Majha Ex-servicemen Human Rights Front. The government is giving Sarai Naga village of this district on the Muktsar-Kotkapura road, the birth place of Guru Angad Dev, a facelift to celebrate his 500th birth anniversary. The shooting for Salman Ahmed’s (of the ‘Junoon’ group) new album “Ghoom Taana” started today with the arrival of Nandita Das in the city. 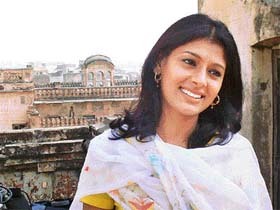 Nandita was involved in shooting for the album in Quila Mubarak complex in the inner city. A high-level delegation from the Bangladesh Railways visited the Rail Coach Factory here yesterday to explore the possibility of importing new design of high speed coaches from India. The Communist Party of India (Marxist-Leninist) yesterday criticised the Punjab State Electricity Board for the fire which burnt wheat crop, in season. The campaign of the Congress nominee, Ms Preneet Kaur, today got a boost with the All-India Bank Employee’s Union announcing its support to her in the coming lok sahba elections. Member of the Dera Bassi Bar Association have submitted a representation to the Chief Justice of the Punjab and Haryana High Court demanding judicial court at the Dera Bassi Tehsil Complex. The district police today arrested two drug peddlers, including a woman, and seized 380 gram of smack from their possession in two separate incidents reported here. According to the police, following a tip-off, a special police party laid a naka near Dhina village on the outskirts of the city. Surinder Singh of the Tej Nagar locality in Sultanwind was allegedly poisoned to death by Mangal Singh and his family members on March 26. However, a case was registered only today following an inquiry by the DSP (Rural-I). The police has arrested Manjit Singh of Hadiabad allegedly for cheating people by promising them jobs in the Railway. It was learnt today that he used to get Rs 50,000 to Rs 2.50 lakh from youths by promising them jobs of ticket collectors etc in the Railways. A criminal case has been registered against Mr Tirlochan Singh, partner-owner of a petrol station, and his two sons for allegedly fabricating documents and becoming the sole proprietor. Police sources said the accused had been booked under Sections 406, 420, 467, 468, 471 and 120-B, IPC. Dr Prem Kumar, Head, University School of Management Talwandi Sabo, today said that though the society was stronger than academicians, they always came to the rescue of society whenever the need arose.